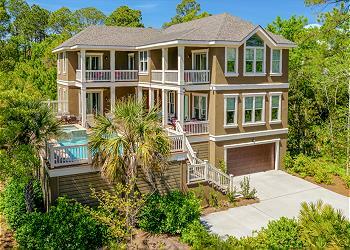 Modern design meets island charm in this spacious Palmetto Dunes retreat. Situated on a large private lot the main house has been totally renovated to feature open and covered decks, with a *heated pool, and expansive views of the relaxing lagoon. In addition to the sun-filled main house with 2 separate living areas is a remarkable carriage house with a king master bedroom, full bath, coffee bar, and gathering room. Plus, it’s just a 3-minute stroll to the soft white sands of the beach! 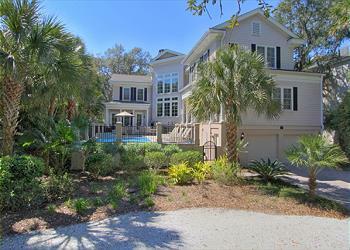 All of which makes this an ideal island home for entertaining all your family and friends! •	*Pools can be heated at an additional charge. This pool has an electric heater. The cost per week is $300 + tax to heat pool.